Reports are that Nanoracks is investigating the development of a new airlock to allow for greater throughput for payloads destined for deployment. This thread is about this new system, which has the nickname of "Bishop". This would be the first commercial airlock ever deployed. Would be interested in seeing any design details or graphics, and also where it would be deployed (would have to be Node 3 Port or Node 3 Aft). it would be a bit more complex than the previous methods due to berthing, unberthing and robotics ops of an object that is either roughly equivalent to the measurements of the full size Cygnus standard PCM in the enhanced proposal or half of one in the currently standard proposal. I'd say that would be best placed on Node 3 Aft, with the SSRMS based on the FGB PDGF for berthing ops, although that would mean that all usable CBM ports would be permanently occupied/reserved for VVs. ISS really could do with a new node. I wonder whether there will ever be enough commercial interest for a privately-owned node/lab module, with it's own integrated external facility/cubesat deployer, etc? Node 3 Zenith is not a usable port due to clearance issues with SGANT-1 on the Z1 Truss. Thus, Node 3 Zenith is blocked off by a PVGF basepoint for Dextre. BEAM will indeed be installed on Node 3 Aft, however it is only planned to be there for a couple of years. Since cubesats are significantly smaller than VV I suspect they could be fired so as to miss the PVGF basepoint. If it the type of PCBM ring collar shown wasn't present it could go on the Node 3 end cone CBM after the PMA-3 relocate task. How about Node 3 port? It will be available after the relocations. By "blocked off", I don't mean that the PVGF is causing a clearance issue, I mean that a PVGF has actually been installed over the CBM port, hence the port is permanently unusable. See attached photo. Though its not 100% accurate, NASA's ISS model can give us an idea of the clearance at the end of Node 3 port with PMA-3 removed. The radiators get very very close and I'm honestly amazed that PMA-3 fits on the end where it is. 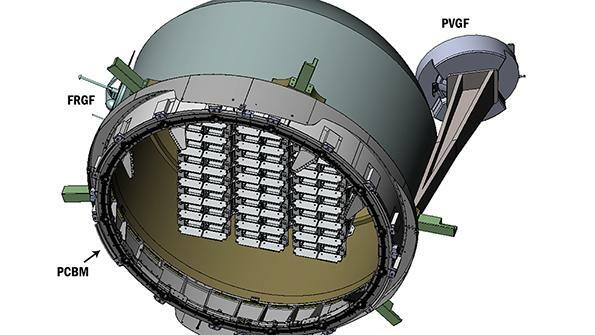 Good article on NanoRacks' proposed ISS experiment airlock, including pictures of the proposed design. NASA could give NanoRacks the go-ahead for construction as soon as next month, and the airlock could launch via Dragon in 2018, for installation on the Node 3 Port CBM. A really great idea, I hope it gets the green light! Seems to have "Evolved" in the last year. IIRC, some of the Node 3 CBM ports aren't really there, they were never fully outfitted. Correct, the Node 3 Zenith port is blocked off with a PVGF, which can serve as a stowage location for the SPDM. This was done as the Z1 Truss SGANT-1 antenna presents clearance issues for any module berthed at Node 3 Zenith. However, this may in hindsight have been a bad decision, as small modules (such as the NanoRacks airlock) could possibly have been berthed at Node 3 Zenith without presenting any clearance issues with the Z1. I don't know whether the Node 3 Zenith CBM port itself would actually be usable if the PVGF were removed, i.e. whether the berthing collar, alignment guides, hooks, bolts etc. are installed. In all the images I've gone over, the Zenith CBM appears to have a thermal cover on it and lacks any visible petals, though it does appear to have the articulation mechanisms for them. Combined with whatever the PVGF is hooked up to, it would seem to be at least a little modified fro the standard CBM. As I seem to recall the Zenith CBM was not fully outfitted on the ground with its ACBM (Active CBM) components but the Cover with the PVGF has a berthing collar is secured to the module via diving the bolts on modules berthing collar into the covers berthing collar. i have still images on my old laptop from the KSC video feeds of it being installed on the Zenith Port. There are no alignment Guide petals that i remember seeing in the images. PS I wish the Nanoracks LUNA Module was still planned. The "Escape corridor" from an airlock is generally downwards and away from the station, so an airlock for CubeSATs on Node 3 Zenith is probably not feasible.